The HP Envy 15t is a notebook laptop that combines Quad Core performance, a subtly engineered design and a superior user experience. It features a genuine Windows 7 operating system for superior digital entertainment and advanced features. The HP Envy 15t is engineered for maximal performance and minimal bulk with the ability of being fully upgradeable with versatility storage to achieve perfect balance between speed and capacity. The HP Envy 15t is built out of advanced materials using precision engineering and state-of-the-art technology to deliver an exciting new experience. The HP Envy 15t measures 38.0 cm x 24.4 cm x 2.65 cm (W x D x H) in dimension and weighs approximately 2.35 kg. It also comes under a one-year HP pick up and return, parts and labour warranty on hardware with 30 days free limited software as well as Total Care friendly, expert, around the clock assistance that is accessible via phone, e-mail and on-line chat. Not only that, it also comes with software including Recovery partition (including possibility to recover system, applications and drivers separately), optional re-allocation of recovery partition, recovery CD/ DVD creation tool, Symantec Norton Internet Security 2009 (60 days live update), and Notebook Help and Support. Other pre-installed software include Microsoft Internet Explorer, Windows Live messenger, Adobe Reader and Adobe Flash Player. In terms of optical drive driver software, the HP Envy 15t comes pre-installed with HP Media Smart Suite, HP Total Care Setup, HP ProtectSmart, Instant-On solution, Cyberlink DVD Suite, Windows Media center, Windows Mail, Corel VideoStudio X2, Corel Paintshop Pro X2 and Stardock My Colours. There is a 2-in-1 integrated Digital Media Reader that is compatible with Secure Digital cards and MultiMedia cards, 3 USB 2.0 ports, one headphone out port and one microphone in port. Additional ports include VGA, RJ-45, and HDMI. Besides that, the HP Envy 15t also has two accessible memory slots that can support a maximum of 8 GB of memory expansion. It also has an integrated network card with 10/ 100/ 1000 Gigabit Ethernet LAN (RJ-45 connector) capabilities that incorporates 802.11 a/g/n WLAN technologies. In terms of its display, the HP Envy 15t sports an HP+ High Definition HP LED BrightView Widescreen Radiance Display that measures 15.6 inches diagonally with a WXGA resolution of 1366 x 768 pixels. In terms of graphics, it also has an integrated ATI Mobility Radeon HD 4830 Graphics card with up to 2811 MB total graphics memory with up to 1 GB dedicated video RAM. There is also a built in nightvision HP web camera with IR LED for illumination situated right above the display, as well as an integrated digital microphone for video conferencing. It is powered by a 6-cell lit-ion battery. Alternatively, it can also be powered by a 9-cell lit-ion battery or even through a wall socket via 120 W AC Power Adapter. Not only that, there is also a full size chicklet keyboard with one touch launch keys and action keys as well as a touch pad that supports multi touch gestures with on/ off button and dedicated vertical scroll up/ down pad. There is also an integrated 56K Modem port as well as Bluetooth wireless networking capabilities. The HP Envy 15t operates on a genuine Windows 7 Home Premium 64 bit operating system that also comes with its respective system recovery DVD. Besides that, the HP Envy 15t runs on an Intel Core Processor i7-720QM processor of 1.6 GHz level 2 Cache 6 MB. As for its system memory, it incorporates 4 GB of DDR3 SDRAM and the ability to support up to 16 GB of DDR3 memory. In terms of storage, the HP Envy 15t has an internal hard disk drive that has a capacity of 320 GB 7200 rpm SATA Hard Drive. The HP Pavilion G71t is a notebook laptop that hails from HP’s entertainment notebook range that is targeted at the budget market. It allows for fast searching, easy browsing, and simple ways to connect. In terms of design, the HP Pavilion G71t features a long-lasting high-gloss imprint finish that is available in black and silver. It also has a simple touch control panel and touchpad design with icons. Besides that, there is also a full-size colour matched keyboard. The HP Pavilion G71t also incorporates an Intel Graphics Media Accelerator graphics card and features improved multitasking with the latest Intel dual core processor. It is also suitable for business usage. The HP Pavilion G71t measures 16.24 in x 10.90 in x 1.42 in ~ 1.77 in (L x W x H) in dimension and weighs approximately 6.72 lbs. It also comes under a one-year HP warranty on hardware with 30 days free limited software as well as Total Care friendly, expert, around the clock assistance that is accessible via phone, e-mail and on-line chat. Not only that, it also comes with a 60 day subscription for Norton Internet Security. There is a 5-in-1 integrated Digital Media Reader, 3 USB 2.0 ports, one headphone out port and one microphone in port. Additional ports include VGA, RJ-45, and HDMI. Besides that, the HP Pavilion G71t also has two accessible memory slots that can support a maximum of 4 GB of memory expansion. In terms of audio features, the HP Pavilion G71t incorporates built-in Altec Lansing stereo speakers. As for multimedia and entertainment features, the HP Pavilion G71t features HP MediaSmart and HP Games by Wild Tangent. It also has an integrated network card with 10/ 100 BASE-T Ethernet LAN (RJ-45 connector) capabilities. In terms of its display, the HP Pavilion G71t sports an HD+ High Definition HP LED BrightView Widescreen Display that measures 17.3 inches diagonally with a resolution of 1600 x 900 pixels. There is also a built-in optical drive storage that can either be a LightScribe SuperMulti 8X DVD +/- RW with double layer support, or LightScribe Blu-Ray ROM with SuperMulti DVD+/ -R/ RW Double layer. The HP Pavilion G71t also has a built in web camera situated right above the display, as well as an integrated microphone for video conferencing. It is powered by a 6-cell lithium ion battery. Besides that, it also comes with photography software including Roxio PhotoShow, as well as DVD/ CD burner and movie software including Cyberlink DVD Suite Premium 6. Not only that, there is also back-up and media management features including Roxio BackOnTrack 3 Deluxe. The HP Pavilion G71t also includes a pair of Mobile Stereo Earbud Headphones in the package. There is also an integrated 56K Modem port. The HP Pavilion G71t operates on a genuine Windows 7 Home Premium 64 bit operating system that also comes with a system recovery DVD. Besides that, the HP Pavilion G71t runs on a processor with a choice of Intel Pentium Processor T4300 (2.1 GHz, 1 MB L2 Cache, 800 MHz FSB), Intel Pentium Processor T4400 (2.2 GHz, 1 MB L2 Cache, 800 MHz FSB), Intel Core 2 Duo Processor T6600 (2.2 GHz, 2 MB L2 Cache, 800 MHz FSB), and Intel Core 2 Duo Processor P7550 (2.26 GHz, 3 MB L2 Cache, 1066 MHz FSB). As for its system memory, it incorporates 2 GB of DDR2 SDRAM (2 Dimm) with the option for a free upgrade to 3 GB DDR2 System Memory (2 DIMM). In terms of storage, the HP Pavilion G71t has an internal hard disk drive that has a capacity of 250 GB 5400 rpm SATA Hard Drive with the option of a free upgrade to 320 GB 5400 rpm SATA hard drive. “This laptop is very good if you think of its low price. And it even has a few things other more expensive laptops don’t: personalization and Wireless. If you think of its price you will realize that this is a very good deal. I will give it a rating of 3 out of 5 stars. To conclude this review, if you are on a budget, this laptop is perfect for you! Although not the best in its class, featuring an Intel Pentium T4300 processor, 2 GB of DDR2 RAM, a Wireless-G Card, and an an Intel 4500M Media Accelerator, the HP G71t is a good laptop. It lacks some power, DDR3 compatibility, and a standalone graphics card. However, for under $570, this is a bargain! This HP G71t review was created to show you both the good and the bad parts of this laptop. The HP Envy 13t is a notebook laptop that is precision crafted for superb performance. It features a genuine Windows 7 operating system for superior digital entertainment and advanced features. The HP Envy 13t is a combination between functionality, strength and weight. It is sculpted from the highest-grade premium materials and is crafted with refinements like HP ClickPad with integrated buttons. In terms of design, the HP Envy 13t features an HP Metal Etching Finish. The HP Envy 13t measures 32.0 cm x 21.5 cm x 2.05 cm (W x D x H) in dimension and weighs approximately 1.7 kg. It also comes under a one-year HP pick up and return, parts and labour warranty on hardware with 30 days free limited software as well as Total Care friendly, expert, around the clock assistance that is accessible via phone, e-mail and on-line chat. Not only that, it also comes with software including Recovery partition (including possibility to recover system, applications and drivers separately), optional re-allocation of recovery partition, recovery CD/ DVD creation tool, Symantec Norton Internet Security 2009 (60 days live update), and Notebook Help and Support. Other pre-installed software include Microsoft Internet Explorer, Windows Live messenger, Adobe Reader and Adobe Flash Player. In terms of optical drive driver software, the HP Envy 13t comes pre-installed with HP Media Smart Suite, HP Total Care Setup, HP ProtectSmart, Instant-On solution, Cyberlink DVD Suite, Windows Media center, Windows Mail, Corel VideoStudio X2, Corel Paintshop Pro X2 and Stardock My Colours. There is a 2-in-1 integrated Digital Media Reader that is compatible with Secure Digital cards and MultiMedia cards, 2 USB 2.0 ports, one headphone out port and one microphone in port. Additional ports include VGA, RJ-45, and HDMI. Besides that, the HP Envy 13t also has two accessible memory slots that can support a maximum of 8 GB of memory expansion. It also has an integrated network card with 10/ 100/ 1000 Gigabit Ethernet LAN (RJ-45 connector) capabilities that incorporates 802.11 a/g/n WLAN technologies. In terms of its display, the HP Envy 13t sports an HP+ High Definition HP LED BrightView Widescreen Radiance Display that measures 13.1 inches diagonally with a WXGA resolution of 1366 x 768 pixels. In terms of graphics, it also has an integrated ATI Mobility Radeon HD 4330 Graphics card with up to 1757 MB total graphics memory with up to 512 MB dedicated video RAM. There is also a built in VGA low light HP web camera situated right above the display, as well as an integrated digital microphone for video conferencing. It is powered by a 6-cell lit-ion battery. Alternatively, it can also be powered by a 4-cell lit-ion battery or even through a wall socket via 90 W AC Power Adapter. Not only that, there is also a full size chicklet keyboard and action keys as well as a touch pad that supports multi touch gestures with on/ off button and dedicated vertical scroll up/ down pad. There is also an integrated 56K Modem port as well as Bluetooth wireless networking capabilities.. The HP Envy 13t operates on a genuine Windows 7 Home Premium 64 bit operating system that also comes with its respective system recovery DVD. Besides that, the HP Envy 13t runs on an Intel Core 2 Duo Processor SL9400 processor of 1.86 GHz level 2 Cache 6 MB. As for its system memory, it incorporates 3 GB of DDR3 SDRAM consisting of one 1024 MB and one 2048 MB DDR3 and the ability to support up to 5 GB of DDR3 memory. In terms of storage, the HP Envy 13t has an internal hard disk drive that has a capacity of 250 GB 5400 rpm SATA Hard Drive. The HP Compaq 8510p is a notebook that provides media and desktop functionalities with a 15.4″ diagonal widescreen notebook which weighs 6.1 lbs and is 1.1 ” in its thickness. It uses the Genuine Windows Vista Business. It also running applications that need bigger performance such as 64-bit computing and also supports up to 4GB of memory. It has the Intel Centrino Pro processor technology that eliminates the TCO of PCs with built in remote and also security. The HP Compaq 8510p also has an integrated graphics card which is the ATI mobility Radeon X2600 graphics that allows DirectX 10 and Dual Link DVI support (with the use of the optional docking ) which provides a better resolution display and a faster performance. In addition to this, it has Blu-Ray DVD +/-EW SuperMulti DL Drive that allows users to play as well as burn HD content from the notebook directly to a dual layer disc and can store up to 50GB. And this can be done with a connection to a HD Display with one HDMI cable. Some of its proffesional tools include Drive Encryption for HP Protect Tools, to increase productivity with HP QuickLook and HP Broadband wireless. The HP Compaq 8510p is a notebook that incorporated Genuine Windows Vista Business, Vista Home Basic, XP Proffesional or FreeDOS. It has been designed with a 1.1″ / 27.5 mm in the front and is about 6.1lbs. It has Intel Centrino with vPro processors and also has Intel Core 2 Duo Processors. It also has ATI Mobility Radeon HD 2600 graphics that has up to 256 dedicated memory and 512 MB HyperMemory. Not only that, it has wireless connectivity options such as integrated HP ev2210 1 x EVDO-A or HP hs 2300 HSDPA Broadband Wireless, Integrated 802.11 a/b/g/draft-n, a/b/g, or b/g wireless LAN module and Bluetooth connectivity. It also has DirectX 10 support and Dual Link DVI that can be optional from from docking. It also has HDMI for video and audio ports, optional Blu -Ray DVD +/-RW SuperMulti DL Drive. In addition to these, it has a widescreen 15.4″ diagonal display that also has a wider viewing angle, Ambient Light sensro and also HP Privacy Filter Support. To have all these features, there is also security features to help maintain user privacy and protect their information by enhanced security features which include Smart Card Reader, Drive Encryption for HP Protect Tools, HP Fingerprint Sensor and TPM 1.2. Some of the software that is included in the HP Compaq 8510p is the HP QuickLook for accesbility to email, calendar and contact information. The hard-drive is user-removable and is up to 200GB 7200 rpm that comes with HP 3D DriveGuard protection. The design of the HP Compaq 8510p is with HP DuraKeys, HP DuraFinish and magnesium alloy display enclosures and support structures. It also comes with touch-sensitive controls for the HP Info Centere, HP QuickLook, wireless on/off, HP Presentation button, volume up, volume down and the mute feature. It also has up to 8GB of 667 MHz DDR2 SDRAM and dual channel memory support. In addtion to this, it has an integrated Intel Gigabit Network Connection and Enhanced Dual pointing devices and a Secure Digital slot. The HP Compaq 6830s is the latest laptop to the Hp Compaq line. This product is a 17-inch notebook. Not just that, this product comes with 2.00 GHz Intel Core 2 duo P7370 processor. On top of that, this product comes with a 3 GB ram. The hard drive of this product is 320 GB. This Hp laptop comes with the latest Windows Vista business. This product comes with various features. Some of the basic features that are included with this product are the Intel core dual processor, 3 GB ram, 320 GB hard drive as well as Windows Vista Business. The operating system is genuine Windows Vista Business with downgrade to Windows XP professional custom installed Chipset Mobile Intel PM45 express chipset ICH9M-enchanced processors available Intel Core 2 duo processor. The 3 GB 800 MHz DDR2 SDRAM makes saving big files easy. The 3 GB memory will be able to hold much more data compared to regular or older laptops and notebooks. The memory of this product is upgradeable to 8 GB maximum. This product also comes with specialized Hp designed DriveGuard. The video memory of this product is such that its 256 MB memory slots 2 DIMM. On top of that, the storage of this system is 320 GB 5400 rpm SATA. Optical drives lightscribe DVD+/-RW supermulti with double layer is also part of this product. Not a sufficient amount of information was released by HP as this addition was just released on to the market not too long ago and HP has promised full specifications and details about the product later. The HP Pavilion dv7-1020us is an Entertainment Notebook PC that has desktop functionalities as well as digital entertainment. It has a 17” HP BrightView Infinity Display with a 1440 x 900 resolution. Powered by 2.0 GHz Intel Centrino 2 Processor Technology that features Intel Core 2 Duo Processor with 3 MB L2 Cache. It also has 4096 MB DDR2 System memory, 320 GB, Hard Drive SATA, NVIDIA GeForce 9600M GT with up to 2302 MB Total Available Graphics Memory with 512 MB dedicated memory. The HP Pavilion dv7-1020us has integrated Blu Ray ROM with Super Multi DVD+/- RW Double Layer, Intel WiFi Link 5100 AGN. The operating software is a Genuine Windows Vista Home Premium. It is been said to be designed with modernity, fluidity and metallic finishes. Its aesthetic also includes a high gloss HP Imprint2 finish in Onyx and Chrome features a grid like mesh pattern that also gives a contrast to the appearance of its liquidity with the metallic finish. It also has a streamlined finish that matches the colour matched keyboard and touchpad. The touch media controls light up and comes to life when the power is switched on that also enhances the streamlined design. It provides users with a QuickPlay feature for users to be close to their DVDs, videos, photos, music, karaoke, games, Internet TV, recorded or streamed TV with a simple touch of a button. It also has an in-built NTSC/ATSC TV Tuner. 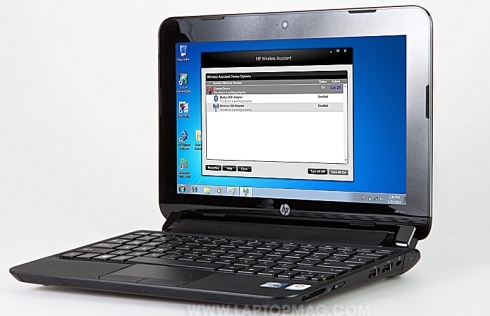 The HP Pavilion dv7-1020us has provided demos that gives an idea of how to add music to slide shows or videos with the drag and drop function and others. It also has a HDMI port to allow users to watch movies on a HDTV. Some of its included software include Muvee AutoProducer that is used to create films that can include effects and transitions. It also includes other inputs such as dual headphone jacks, 1 pair of stereo earbud headphones as well as an HP Mobile Remote control. Measures at 15.59” x 11.22 “ x 1.31 and weighs 7.64 lbs. The HP Pavilion dv7-1020us is both an entertainment centre as well as packed with desktop features. It is powered by 2.0GHz Intel Core 2 Duo P7350 processor together with a 3MB L2 Cache. It also has a 4096 MB of DDR2 memory, a 320 GB 5400 RPM hard drive, an NVIDIA GeForce 9600M GT Video Card, a Blu-Ray ROM with SuperMulti DVD R/RW Double Layer Drive, Intel Wi-fi Link 5100 AGN wireless. All these features comes in its 17.0” WXGA display that has BrightView Infinity Widescreen display, four USB 2.0 ports, and wireless connectivity. It runs on a Genuine Windows Vista Home premium 64 bit with service pack 1. The wireless connectivity is from its Intel WiFi Link 5100 AGN. The sound for its entertainment is through its Altec Lansing internal speakers. Its keyboard is 101 key compatible and has a touch pad with on/off button with dedicated vertical scroll up/down pad. It also has one express card or 54 slot that supports Express Card ¾. The HP Pavilion dv7-1020us has 5-in- 1 integrated Digital Media Reader for Secure Digital Cards, Multimedia cards, Memory Stick, Memory Stick Pro, or xD picture cards and supports several types of adapters. It also had four USB 2.0 ports, one VGA, HDMI, eSATA,RJ-11, RJ-45 and IEEE 1394 firewire. It also has two headphone out/stereo and expansion port 3 and Consumer IR. The power is supplied from a 90W AC Adapter and a 8-cell Lithium Ion battery. The sales package contains a HP remote control and TV Tuner. The operating system is a Genuine Windows Vista Home Premium 64-bit with Service Pack .It has several security features including a Symantec Norton Internet Security 2008 that includes a 60 day complimentary Live Update, HP Help and Support Center, HP PC Recoery and HP Total care advisor. The multimedia softwares include Cyberlink DVD Suite, Muvee AutoProducer, HP Quick Play, HP PhotoSmart Essentials, Vongo, HP Games Powered by Wild Tangent and Adobe Photoshop Elements. Its business softwares include Microsoft Works, Microsoft Office 2007 Student and Teacher Edition a 60-day trial version and HP Smart Web printing. The internet solutions software includes Adobe Reader, HP Wireless Assistant, HP Easy Internet Sign up, Microsoft Internet Explorer and AOL Instant Messaging Service. HP Pavilion dv7-1020us Measures at 15.59” x 11.22 “ x 1.31 and weighs 7.64 lbs.